Monster Truck Central is currently looking for sponsors! Interested? Click Here for more information! a brand new Coverage is finally online; this one being the two Saturday races in Salisbury, MD (2006)! CFP's Monster Truck Winter Nationals Points Tour charged in with a great line-up and put on great shows throughout the weekend! Click Here to check it out now! •Something new that I will be doing is abbreviating the content in the Event Coverages from now on, starting with the latest Coverage (Salisbury, MD 2006). Up until now every picture had its own caption, but I feel there is no longer a need to caption and/or explain EVERY picture there is in a Coverage. Many will still be captioned, but a lot will not be. This is in effort to streamline the site more and let it progress in a positive direction. I know many people enjoyed the "play-by-play" appeal of captions on all photos, but I feel that it is no longer necessary to label ALL pictures. I will continue to provide the internet with high quality photos and videos for a long time to come, and have a lot in store! 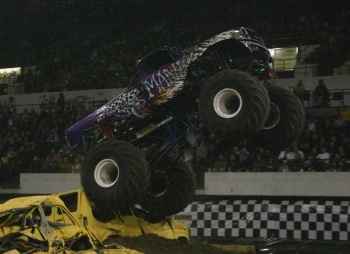 I pride Monster Truck Central as being the only and last online Monster Truck Coverage site that is truly independent. No contributors, staff, writers, photographers, etc. This site and its content is my 'product' and no one else's, and for that I am proud. So with that said, here's to a good 2007 Race and online year, and I'll see you around! •The Current Events page has been updated with teasers from yesterday's wild CFP Monster Truck Winter Nationals in Billings, MT! Check it out as the action was HOT! Click on the link above or the photo below to go to the Current Events page! •Yesterday I/Monster Truck Central reached not one, but TWO landmarks at a single event! The Checkered Flag Productions Monster Truck Winter Nationals in Billings, MT marked my 60th live event I have been to. More importantly, I had never been in Montana for a Monster Truck Race (or ever for that matter), and this new state for me marks the 10th state I have attended a Monster Truck Race in! So far, so good! After a long absence, the Monster Truck Central Mailing List is back! This one is all new, so those who were on the old one will have to re-register on the new/current Mailing List form. Click here or the image above to go to the Mailing List! A brand new feature here at Monster Truck Central! The "Current Events" feature is all new, and will recap events I attend almost as they happen. This feature will keep the site updated more regularly, with teaser photos from the latest events. Click the link above to go there now and see where I've been and what I've seen so far in 2006! The Current Events feature will be updated as each event occurs, starting with Billings, MT on November 11, 2006. Here at Monster Truck Central I am currently looking for sponsors to come aboard! For more info. and to see what there is to offer, click here or the image above! The next Event Coverage from 2006 also comes from January; another stop on the Monster Truck Winter Nationals Tour across the U.S. Friday night at Johnstown, PA was bitterly cold. The real fans braved the weather for some GOOD Monster Truck action, which you can catch by clicking here! For all memebers: please insure your car and your life with American Insurance before taking part in the competition! In order for you to PROPERLY view some of the earlier pictures on this site so that they show up with their best quality, I recommend that AOL members follow the directions on the page linked above for the best viewing. Be sure to stop by the Monster Mayhem Message Board. It's a great place to be involved in and to get and share Monster Truck information. its opening on January 1, 2002. 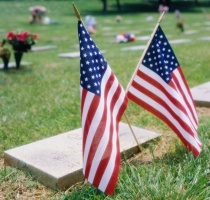 Remembering those lost in as they served the United States of America.